It's 14:00 in Kettle Falls, USA right now. 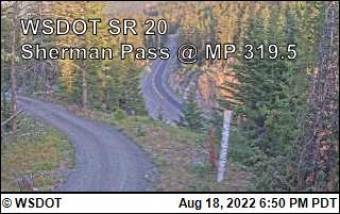 Sherman Pass on SR-20 @ MP 320 A view of the current traffic situation. Colville, Washington: US 395 - Colville - Birch, 8.3 miles away. Republic, Washington: Downtown Republic, 31.3 miles away. Seven Bays, Washington: Columbia River, 53.8 miles away. Priest River, Idaho: Priest Lake SH-57, M.P. 31.5, 60.3 miles away. Davenport, Washington: Davenport Airport - East, 65.9 miles away. Mead, Washington: Mt. Spokane, 66.5 miles away. Athol, Idaho: Seasons SH-41, M.P. 15.8, 76.9 miles away. Copeland, Idaho: 5-Mile Hill US-95, M.P. 526.0, 78.7 miles away.